Looking back at May I see I have managed to write, not every day, but on 22 days out of 31, which I don’t think is too bad. On the days I haven’t written, mostly, I’ve been able to do something else creative. And if I haven’t managed to do even that, I have at least read in one of my books. Here’s a sample couple of pages from the last week of May. It’s usual, if you’re writing or trying to write, to count the words you managed to get down each day. It’s standard practice for everyone involved in the NaNoWriMo, for instance, and many successful writers identify target numbers of words to write daily in order to feel they are getting somewhere. But what happens when you’re working but not writing words? If you are editing (which may well mean striking words). Or if you are researching, or scribbling notes, or just thinking about the way a story is going. How do these activities convert into counted words? I don’t know. Perhaps established writers consider all that just topping on the bread and butter of the word count? 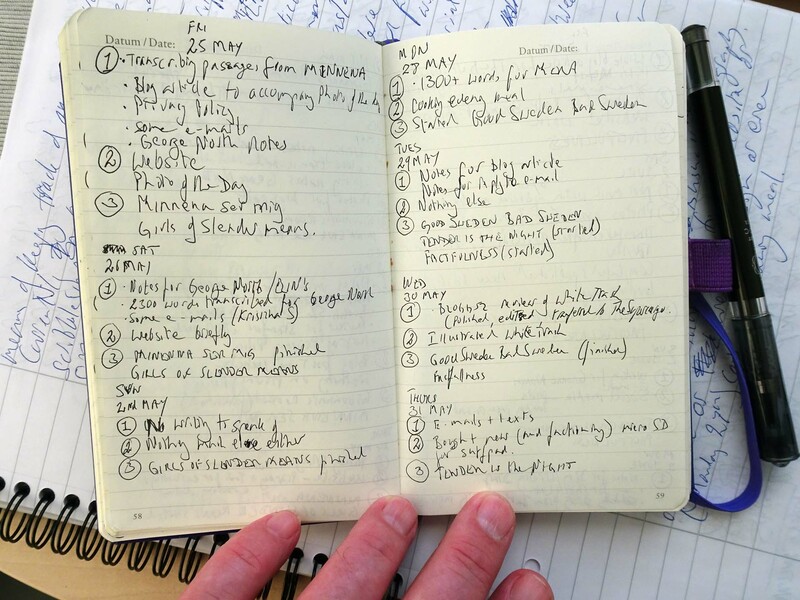 For me though, my writing diary casts the net wider than just counting words. Words written, which as you can see I do use, only applies to words in the computer. Words transcribed from my handwritten notes into a word processing programme, which automatically counts them for me. But creative writing also includes sitting and writing in my notebook, and sometimes (though clearly not on these days in May) sitting with a timer and keeping account of the hours I spend working. Hours that may involve gazing vacantly into space or talking to myself as I walk around my local park. I count writing letters and diary entries, e-mails and comments on social media as writing too. Also copy for the website and translation work in my firm. Is that cheating? There is a certain creativity involved after all. I’m in two minds about it still, but it’s my ambition to reach a point where all this other writing is just a few percent of my total output. A lot of people got very hot under the collar about the GDPR. I saw some people blaming the EU for all the busy screens and clogged mail boxes. It was the EU’s General Data Protection Regulation after all. But, seriously, most of the trauma of that week was the fault of all the myriad of e-commerce people who left complying with the new law to the last possible minute. The EU gave everyone two year’s grace, so why send out all those weepy “let’s stay in touch” messages just in the last week of May 2018? In fact the GDPR strikes me (as a consumer on the Internet) as a Good Thing. It’s not perfect, I’m sure, but anything that tries to put control of my personal data back into my hands has my vote. It’s significant that it was the EU doing this. If one single country had tried alone, the data traders would either have ignored them (if the country was small enough) or launched crippling legal actions, fighting the law tooth and claw. There’s no guarantee they won’t get around to that with the GDPR of course, but taking on one of the world’s largest political and legal units is – hopefully – a bit more daunting. One thing that puzzled me about the on-line vitriol I saw poured on GDPR around the 25th, was how some of the people doing the criticising seemed to feel the GDPR infringes on their freedom. Their freedom to be exploited by Big Data? I can’t make that add up. I remember George Hanson in Easy Rider: “It’s really hard to be free when you are bought and sold in the market place.” As far as I can see the GDPR offers at least some protection against that kind of commercial exploitation. But perhaps I’m missing something. Let’s round things off for this entry by noting one other item in the illustration. The eagle-eyed will perhaps pick out the names George North and Elin. George North is one of the subsidiary point-of-view characters in Elin’s Story: The Long Way to London. Like Elin herself, he is a real historical character. I mean there was a real George North. He accompanied Princess Cecilia on the long journey to England and was very involved in the Princess’s ill-fated stay in London (Elin’s Story: London in Credit and Debt). He left a lighter trace even than Elin in the historical record. In order to flesh him out but stay true to his character as it’s exhibited in the record, I’ve been trying to reconstruct his life up to the point it intersected with Elin’s. I’m doing this by writing a first-person account of his life as George might have done. The idea is that eventually I’ll get him on the same ship as Elin and then he can give me his take on the events Elin sees – and also tell me about some of the things she doesn’t. It’s a little more difficult than I thought it would be when I started, but very interesting nevertheless. George claimed to be a scholar and a gentlemen, distantly related to Lord North, a baron of Cambridgeshire. I’m currently trying to reconcile this with the probability he was actually the son of a London tailor. I’m also trying to work out when he first visited Sweden. I’ve written over 3500 words for George’s story already… but who’s counting? Som alltid, intressant läsning. Tycker om ditt sätt att skriva upp dina framsteg från dagen. Tänkvärt och värt att prova på!